Q: A detailed explanation on the interface for the PPC BidMax. Screenshots below show the interface for Bid Maximizer. Bid Max is known for its neat and intuitive user interface. The heart of the program is the tree panel workspace through where you can navigate your accounts, keyword bidding information and competitor listing details in one screen. 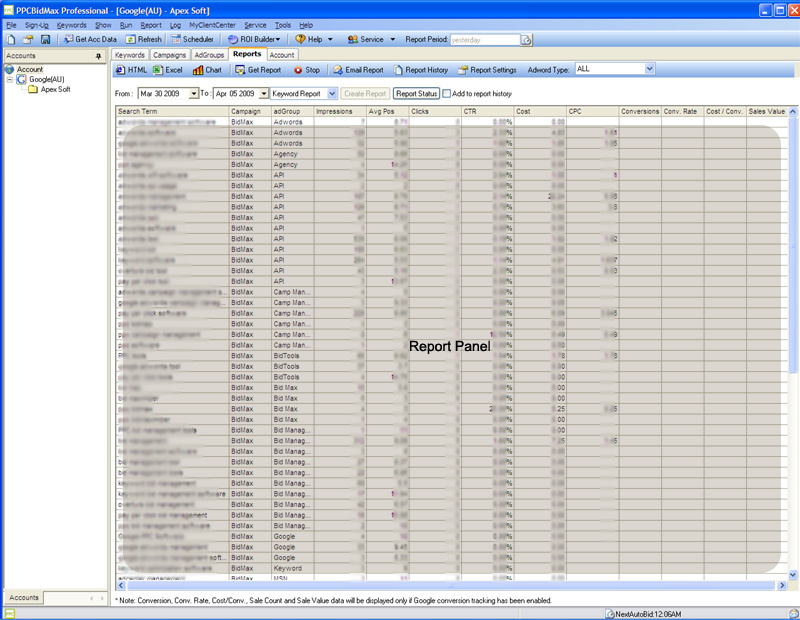 Bid History Panel - allows you to monitor the bid history for the selected keyword. 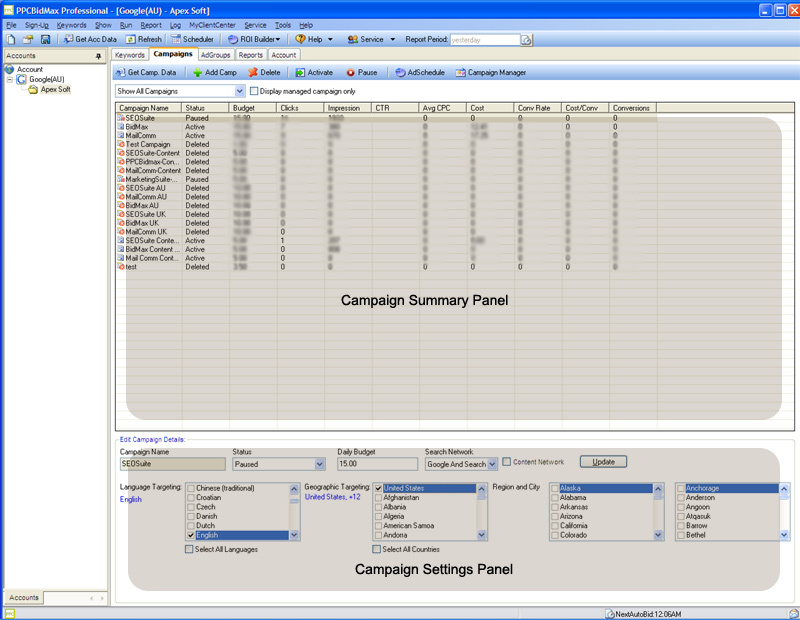 Campaign Settings Panel - allows you to change the setting of the selected Campaign in the "Campaign Summary Panel"
AdGroup Setting Panel - allows you to change the setting of the selected AdGroup in the "AdGroup Summary Panel"
Report Panel - this panel allow you to preview the report done according to your chosen report period and type. Edit Scheduler Settings	- Open the Scheduler Settings Window. Campaign Filter - Lets you choose a campaign. 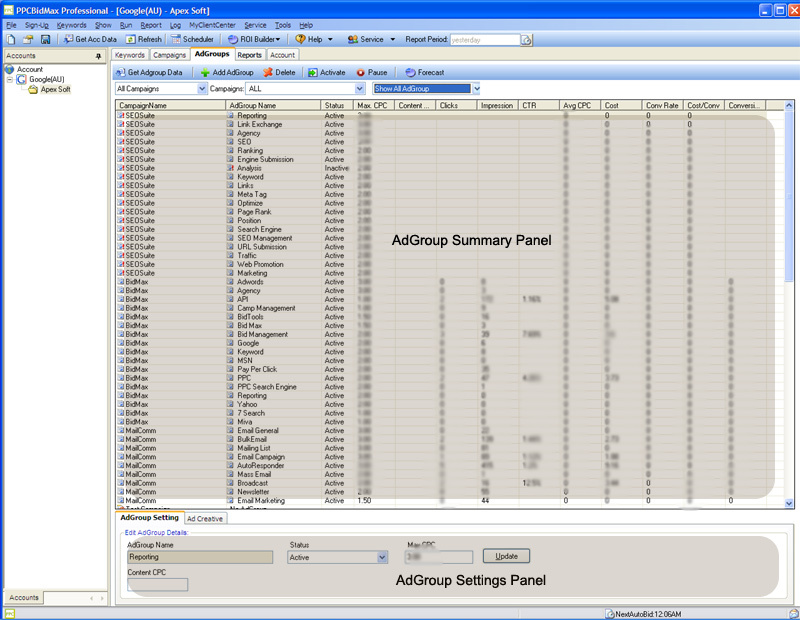 Program will only show the Adgroup(s) and Keyword belong to campaign selected. AdGroup Filter - Lets you choose an Adgroup. Program will only show the keyword(s) belong to adgroup selected. Category Filter	- Lets you filter the keywords display using the Category that you have created and assigned.